"Seeing is Believing" - On February 24th, Peter Jennings and ABC News will be bringing it's U.S. viewers a real treat in primetime. 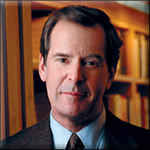 Peter Jennings will be reporting on the subject of UFO's. Something not attempted by the "Big 3" networks ever that I can remember. With over 50% of the population now believing in extraterrestrial life, I say it's about time. And the community should be very excited. Not because of what they are going to reveal, but for the fact that it is on at all. FINALLY is what I say. Our nation and world for that matter has moved beyond the fear of little green Martian men stage. The concept of another intelligent race existing in this universe is common thought. With the discovery of planets almost daily now, even mainstream science is asking "Where are they?" Some of the subjects covered will be the old classics and some of the most intriguing cases that have baffled UFO buffs and scientist alike. Roswell will be covered as it's one of the most widely known cases in history. The Air Force's explanation of what happened was so ridiculous, it strengthened my belief that something strange happened there back in 1947. Other subjects include The Minot AFB nuclear silo incident, The Phoenix Lights, and the St. Clair County sightings. To anyone in the UFO community, there probably won't be anything revealed that you haven't heard of, but the great thing here is that the community might grow tremendously from this. No mind blowing news, but the fact a major network is carrying this is mind blowing to me. Kudos to ABC for taking the first stand. I hope it pays off for them. I can only hope the others will catch wind of this and follow suit. It had some good points and it had points that could have been left out, but overall I have to say it was a success. Peter Jennings reported in a non-bias fashion as expected, the format and flow of the show was well done. I feel it was very fair and balanced. Animations we superb and really enhanced the story being told. Actual footage was used where available. Each case was presented well with the exception of Roswell. I was very disappointed in how they presented it as if they were simply trying to sell books. Instead of presenting Stanton Friedman as someone who has high degrees in physics, and worked as a nuclear physicist for companies like GE, GM, Westinghouse, Aerojet General Nucleonics, and McDonnell Douglas on such advanced, classified projects as nuclear aircraft, fission and fusion rockets, and nuclear powerplants for space, they presented him as a book peddler. Nothing was mentioned about his incredible work in the government covered-up MJ-12 documents. Dr. Michio Kaku's piece on wormholes was great. It showed how it really may be possible for future physicist with future technology to harness the power of stars and fold space allowing us to travel vast distances instantaneously. The shortest distance between two points is not a straight line. Explained where even the layman could easily understand the possibility. Overall, as I stated before, the most important thing here is the fact that a major broadcast company and respected journalist presented this in primetime. Searches for the subject matter have already tripled since the airing, showing a new spark of interest in the genernal public. THAT my friends is good news. Thanks ABC! What's next on the subject?